To commemorate Washington's emotional farewell to his officers that took place in our famous Long Room on December 4, 1783, a special reenactment of the farewell will be performed by a George Washington reenactor throughout the day in the Long Room. After the performance, visitors can interact with George Washington, take a docent-led tour of the Museum, and snap a photo in the colonial costume photo booth! $1 Museum admission all day long! For this special event, we are offering $1 admission to the Museum and all the day's events; which include the reenactments in the Long Room. 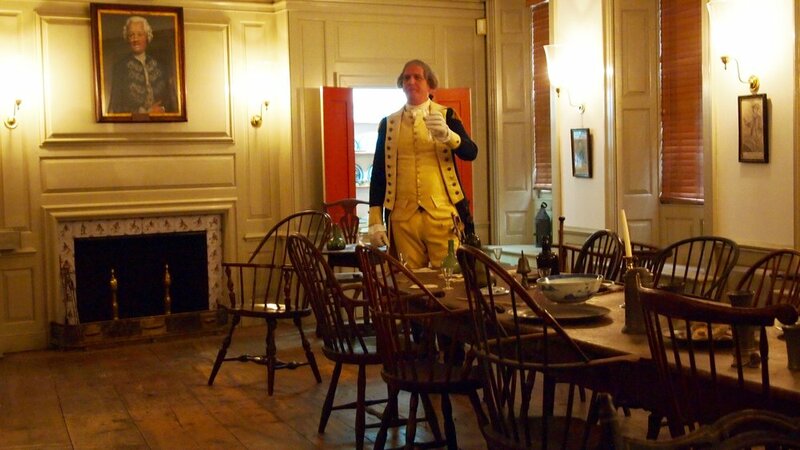 Each reenactment of the farewell toast will be given in the actual room where George Washington bade farewell to his officers on December 4, 1783. There will be 5 performances of Washington’s Farewell Toast throughout the day. Tickets for timed performances will go on sale on our WASHINGTON’S FAREWELL page on November 15 at 10:00am. Click the link below to visit the page, where you can purchase tickets, read important information, and view a full schedule of events! You must purchase a regular $1 Museum ticket for the following events. Visitors will have an opportunity to meet The General himself in the Flag Gallery. Don't miss your chance to learn the history of our nation's founding straight from the Country's First President. Your purchase of a regular Museum ticket includes access to all of our gallery spaces, including our newest exhibition, Fear & Force: New York City’s Sons of Liberty. On this tour you will get a look at the entire museum and all its gallery spaces. All guided tours will start in the Flag Gallery and are free to the public with the purchase of Admission. You can don a tricorne hat or an apron and pop into our Colonial Photobooth to #RockOutWithYourFrockOut! Snap a photo with family and friends or with our mascot, Paul the Pewter. Make sure to share your photo on social media using #frauncestavern. Special thanks for Insomnia Cookies for donating 100 cookies in honor of this special event! Make sure you come early - they won’t last all day!